Joining Bart this month are Nick Riley, Lynda Gousha, Scott Willsey from the Don’t Nihongo it Alone podcast, and Gazmaz from the MyMac podcast. 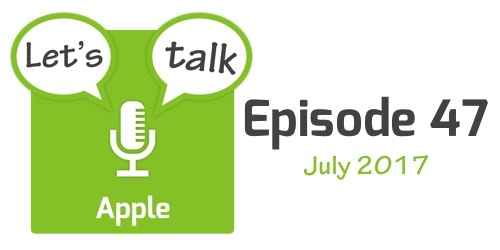 The show starts with some quick followup stories before moving on to look at some Apple-related notable numbers, legal news, and staff changes that made the news in July. The four main stories for the month were Apple’s Q3 earnings call, the death of the traditional iPod, the continuing battle against encryption, and the leaking of some information about the up-coming iPhone through an accidentally released software update for the HomePod. The show finishes with a quick rundown of some shorter Apple-related stories that made the news in July.